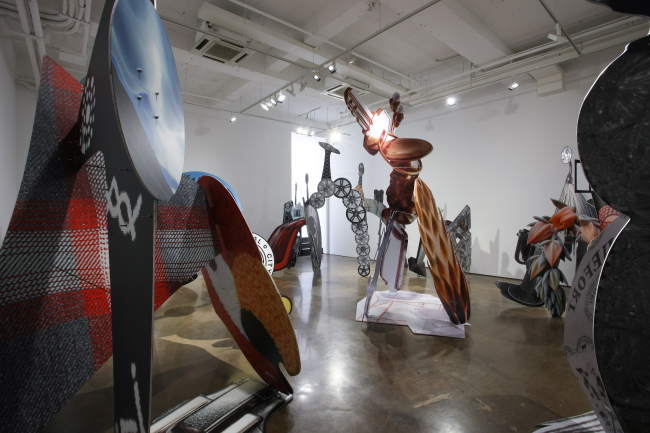 “New Structure and Relief”: Artist Gwon O-sang, known for his sculptures made with photographs, is presenting his new series in a solo exhibition at Arario Gallery Seoul until Aug. 21. The artist presents his reinterpretation of Alexander Calder’s iconic stationary sculpture “Stabile” in his new series of photograph sculptures “New Structure” that consist of printed images and aluminum sheets. Another new series “Relief” features collages of images posted on wooden panels. For more information, visit www.arariogallery.com. “Wellknown Unknown”: Kukje Gallery is holding a group exhibition featuring seven young artists whose works cover a wide range of genres in contemporary art. Curated by Kim Sung-won, an independent curator, critic and art professor, the exhibition introduces seven artists and teams, including Kim Hee-cheon, Nam Hwa-yeon, Oh Min, Kim Young-na, Yi Yun-yi, EH and VERYTHINGS. They explore different and opposite sides of contemporary society such as appearance and disappearance, emergence and withdrawal, and celebrity and anonymity. The exhibition runs through July 31. For more information, visit www.kukje.org. “Middle of Nowhere”: Salon de H is holding a solo exhibition of artist Woo Kuk-won until Aug. 12. The artist’s paintings, which appear to be random scribbles and spontaneous texts, are results of the artist’s exploration of his inner mind. His desire for freedom is portrayed in the “Bluebird” and “Somewhere” presents ideas on his bucket list as well as his hope and longing. For more information, visit www.salondeh.com. “Spartacus”: Korean National Ballet will perform Khachaturian’s “Spartacus” at the National Theater of Korea from Aug. 26-28. The three-act ballet chronicles Spartacus’ fight for freedom after he and his wife are captured by Roman consul Crassus. The performance will begin at 7:30 p.m. on Friday and at 3 p.m. on weekends. Tickets range from 10,000 won to 30,000 won and can be reserved at ticket.interpark.com. For inquiries, call (02) 587-6181. “Tchaikovsky Ballet Fantasy”: Wise Ballet Theater will present Tchaikovsky’s ballet performance at the National Theater of Korea KB Haneul Youth Theater at 2 p.m. and 4:30 p.m. from Aug. 12-14. The performance aims to provide children and youths on summer vacation with a chance to enjoy a classical ballet performance. The program will feature parts of Tchaikovsky’s three renowned ballets -- “The Sleeping Beauty,” “The Swan Lake” and “The Nutcracker.” Commentary for children will also be provided. Tickets range from 25,000 won ($22) to 30,000 won and are available at www.ntok.go.kr or ticket.interpark.com. For inquiries, call (02) 547-9851 or (02) 547-9853. “Giselle: A Death-defying Love Story”: Universal Ballet will kick off a local tour with “Giselle” at the Chungmu Arts Hall from Aug. 12-14. “Giselle,” choreographed by Jean Coralli and Marius Petipa, is a romantic ballet in two acts which premiered at Universal Arts Center (previously Little Angels Art Hall) in 1985. The ballet depicts the tragic love story of the peasant girl Giselle who tries to save her lover from a group of supernatural women despite his betrayal. “KNCDC-Theatre de Liege Collaboration Nativos”: The Korea National Contemporary Dance Company and Ruda asbl & Theatre de Liege will premiere “Navitos” at the Seoul Arts Center Jayu Theater from July 15-17. “Navitos,” choreographed by Ayelen Parolin and Marc Iglesias, repetitively presents certain movements, along with a traditional percussionist presenting shamanic tones. The performing team will also kick off its world tour from Nov. 15 to Dec. 8, visiting France, Belgium, and Italy. The performance begins at 8 p.m. on Friday and at 3 p.m. on weekends. 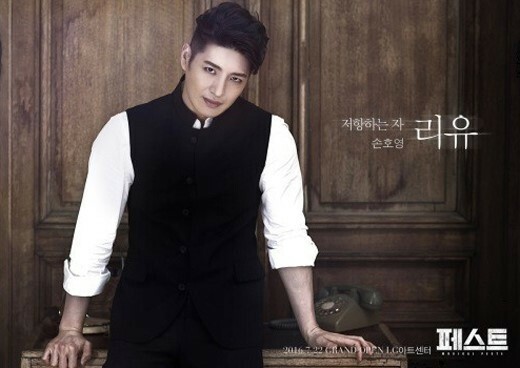 Tickets range from 20,000 won to 30,000 won and can be reserved at www.sacticket.co.kr or ticket.interpark.com. For inquiries, call (02) 3472-1420 or (02) 6196-1616. 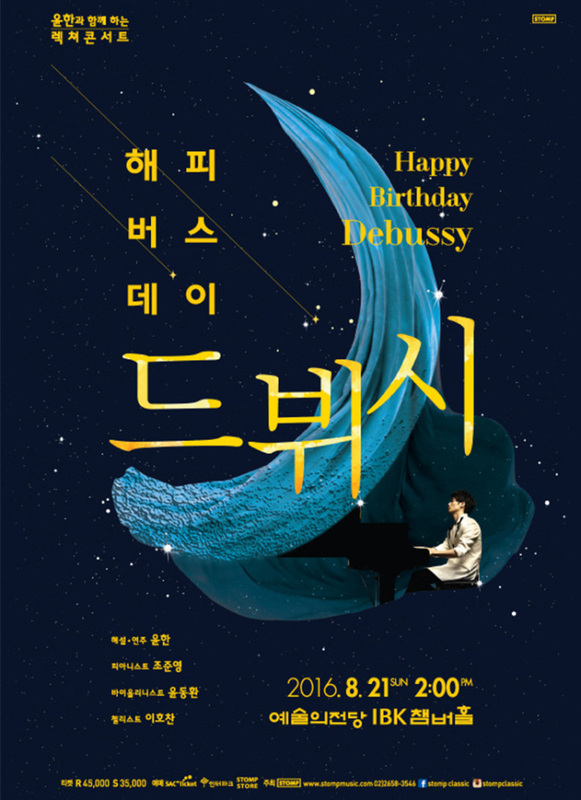 “Happy Birthday Debussy”: As part of the “Happy Birthday” lecture-concert series, Korean pianist Jeon Yoon-han will be leading a special tribute to French composer Claude-Achille Debussy’s 154th birthday at the Seoul Arts Center Concert Hall at 2 p.m. on Aug. 21. In addition to Jeon, there will be performances by pianist Cho Jun-young, violinist Yoon Dong-hwan and cellist Lee Ho-chan. The program will feature some of Debussy’s most prominent works, including Arabesque No. 1, Suit Bergamasque No. 3 and more. Tickets range from 35,000 won to 45,000 won and can be reserved at www.sacticket.co.kr. For more information, call (02) 2658-3546. “Orquesta Nacional de Espana”: Orquesta Nacional de Espana led by Antonio Mendez will kick off its first concert in Korea at the Seoul Arts Center Concert Hall at 5 p.m. on July 17. The Spanish national orchestra, founded in 1937 during the Spanish civil war, has participated in numerous Spanish festivals and toured across Europe, America, and Asia. The program will feature Turina’s “Danzas Fantasticas,” Falla’s “Noches en los Jardines de Espana” and “El Sombrero de Tres Picos, Suites 1&2” and Ravel’s Piano Concerto in G major. Pianist Paik Kun-woo will accompany the orchestra. Tickets range from 50,000 won to 220,000 won and can be reserved at www.sacticket.co.kr. For inquiries, call (02) 599-5743. “Eddy Kim – Hello Summer”: Singer-songwriter Eddy Kim, known for his crooning acoustic tunes, is holding a concert at Ewha Womans University Samsung Hall on July 23-24 at 7 p.m. Saturday and 5 p.m. Sunday. 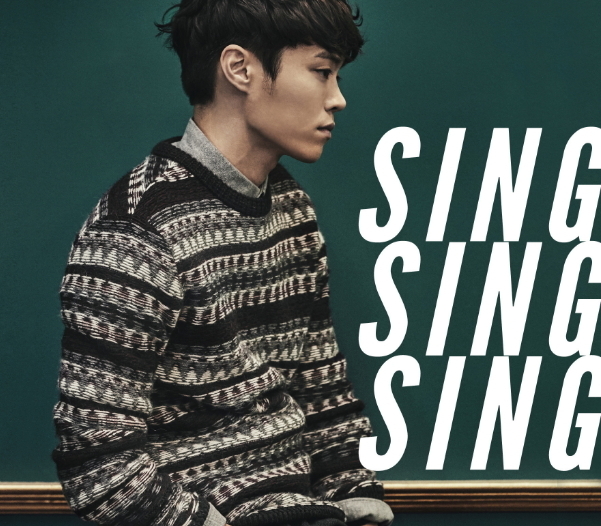 Eddy Kim, who debuted in 2014 with the album “The Manual,” has since come to be known for romantic tracks like “My Love.” His recent modest hits include the funky “Paldangdam” and the rhythm and blues ballad “My Lips Like Warm Coffee.” All seats are priced at 88,000 won and tickets can be purchased at ticket.interpark.com. “2016 Jisan Valley Rock Music & Arts Festival”: The seventh installation of the rock festival is taking place July 22-24 at the Jisan Forest Resort in Icheon, Gyeonggi Province. This year’s lineup will feature world-class acts like Red Hot Chili Peppers, the iconic American rock band set to return with its 11th album in June; Russian-German DJ Zedd; and English electronic duo Disclosure. Local indie-rock acts Kiha & the Faces, Guckkasten, Hyukoh and others will be performing as well. Tickets range from 136,000 won to 221,000 won and can be purchased at ticket.interpark.com. “2016 JYP Nation Concert”: The biggest talents from JYP Entertainment, one of Korea’s largest entertainment companies, will gather for two days for the agency’s biennial concert from Aug. 6-7 at Jamsil Arena in Seoul. The lineup includes some of the most renowned names in K-pop: Wonder Girls, GOT7, Twice, 2PM and many others. Tickets range from 110,000 won ($96) to 99,000 won, and can be purchased at ticket.interpark.com. “Someday Festival 2016”: The two-day outdoor music festival is back again this year to bring together both prominent and up-and-coming musicians at Nanji Hangang Park in Seoul from Sept. 3-4. The lineup includes popular soul and R&B singer Kim Bum-soo, female duo J Rabbit, as well as The Barberettes, Bily Acoustie, Thornapple and many others. Early bird tickets range from 82,000 won to 109,000 won, and can be purchased at ticket.interpark.com.